YouBIM is a cloud-based BIM for facilities management that integrates databases. It provides instant access to asset location and information through its navigable and user-friendly interface. Because of its cloud deployment, you empower your employees to search and retrieve data that are helpful to them on the field. YouBIM further enables this by being web browser and device agnostic so you and your employees can open your portals on your preferred browsers and electronic appliances. Moreover, YouBIM simplifies accession to information through its connections with databases. On top of that, it can give you the data and documents you need with a single click. As YouBIM is deployed as SaaS, it means that it is accessible from any web browser. Thus, you and your employees can view and edit information on the system regardless of the device you are using. Furthermore, YouBIM’s homepage displays a host of overview widgets. These show a variety of information to give you a quick look into your facilities’ performances, work orders, alarms, and more the moment you access the platform. Though it is web-based, YouBIM is still equipped with quick-running yet powerful 2D and 3D viewers. You can use these to examine floor plans to retrieve information. This is especially beneficial in helping your personnel understand the building or structures they have to manage and maintain. Additionally, the 3D viewing solution enables users to see through objects such as walls, ceilings, and floors. This capability lets your employees locate devices and components that they otherwise would not be able to easily see or find. With a single click, you can access the necessary information from YouBIM. The platform allows you to draw data and documents by selecting a component from a list or from search. Information provided by the solution can be uploaded from BIM, COBie Spreadsheet, or from other databases. With this, you can instantly get the data you require without having to open another application. Aside from its import/export capabilities and plugins, YouBIM has a host of APIs you can utilize to retrieve and exchange data from and with multiple related systems. This streamlines the process and ensures that you have the relevant information for smoot lifecycle management. YouBIM has a Work Order module that enables you to trigger work requests or work orders directly from the 2D and 3D viewers. It complements your Work Order Management System as YouBIM transfers the work order data to your preferred application after its generation. Aside from that, YouBIM also saves information regarding the work orders connected to assets. 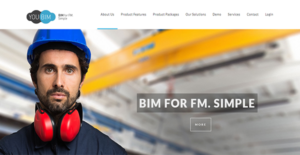 If you are considering YouBIM it might also be sensible to check out other subcategories of Best Building Information Modeling Software - BIM listed in our base of B2B software reviews. Since each organization has particular business needs, it is advisable for them to abstain from searching for a one-size-fits-all ideal software system. Needless to say, it would be pointless to try to find such a platform even among popular software platforms. The intelligent thing to do would be to catalog the various vital elements that need consideration such as required features, finances, skill levels of staff members, company size etc. Then, you should do your homework thoroughly. Read some YouBIM reviews and look into each of the other systems in your shortlist in detail. Such in-depth research can make certain you discard ill-fitting platforms and choose the system that presents all the elements you need for business success. How Much Does YouBIM Cost? YouBIM has three enterprise pricing options, each with two deployment choices. The packages and the pricing models are outlined below to help you decide which one is the most suitable for your organization. We realize that when you make a decision to buy Building Information Modeling Software - BIM it’s important not only to see how experts evaluate it in their reviews, but also to find out if the real people and companies that buy it are actually satisfied with the product. That’s why we’ve created our behavior-based Customer Satisfaction Algorithm™ that gathers customer reviews, comments and YouBIM reviews across a wide range of social media sites. The data is then presented in an easy to digest form showing how many people had positive and negative experience with YouBIM. With that information at hand you should be equipped to make an informed buying decision that you won’t regret. What are YouBIM pricing details? What integrations are available for YouBIM? If you need more information about YouBIM or you simply have a question let us know what you need and we’ll forward your request directly to the vendor.